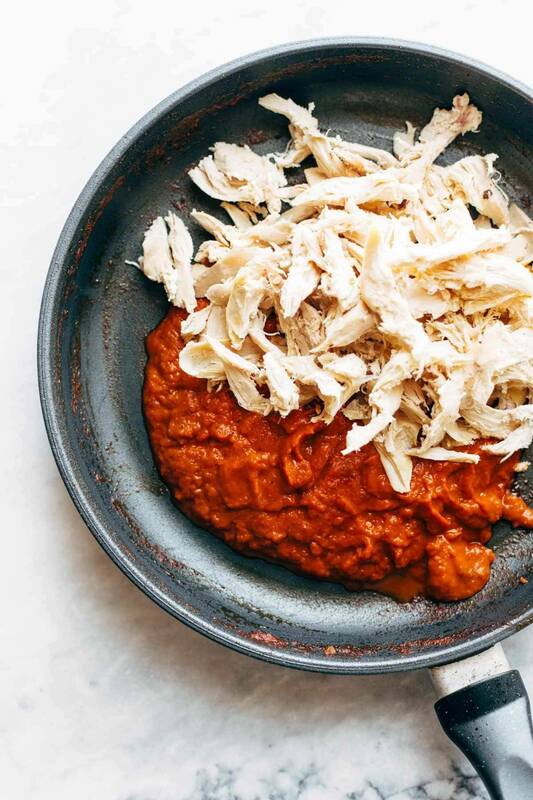 One: This recipe is from my friend Melissa’s cookbook coming out TOMORROW YO called The Minimalist Kitchen (affiliate link). 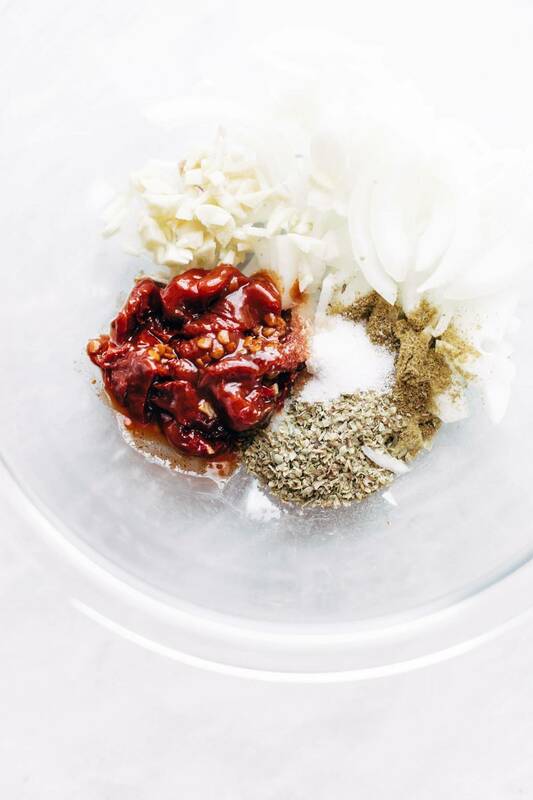 It is a beautiful, inspiring, and (here’s my favorite part) practical cookbook. Oh, hey, and one other thing! It’s also more than a cookbook. 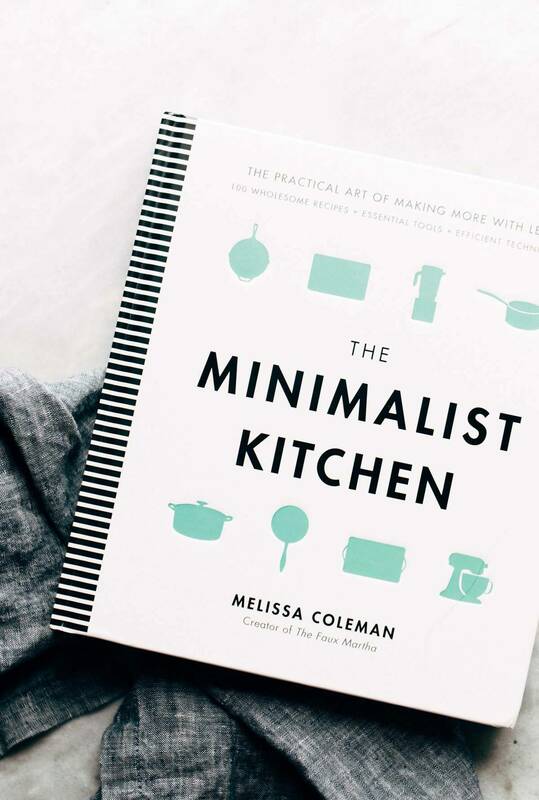 Melissa’s expertise isn’t just real life recipes – it’s getting your kitchen life structured in a way that removes the clutter and stress while bringing the art and the craft and the joy (!!) back to cooking. You should definitely, absolutely get this book. I do not recommend cookbooks often, because, well, mostly we all just buy cookbooks and then get all our recipes online. I only recommend the ones I really think will be worth your while. This is one that will be well-loved with splattered and dog-eared pages. This is one for real life. This will be worth your while. You can click here (affiliate link) to find the book in Amazon-land. 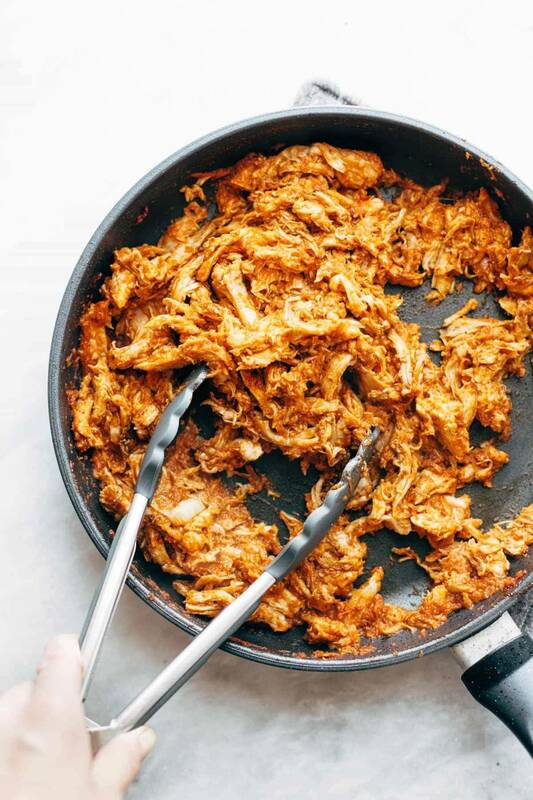 Two: Naturally, being that this chicken tinga tacos recipe is from The Minimalist Kitchen cookbook, it is minimal. Yum! Just in time for taco Tuesday. I was worried they were going to be super spicy but I think next time I’ll be more adventurous and use three Chipotle Chile’s. I love that you described these as a “taco unicorn” ~ that’s perfect! I love that these are so simple but look so wowza. I’m bummed that I don’t have a gas stove to char the tortillas, but appreciate your suggestion for electric stoves too! holy cow! charring that tortilla is a game changer, this recipe was so fun, so amazing, so tasty! I LOVE IT! Taco Tuesday has a new feel, I will never make another blah taco ever. SO GOOD! Glad to hear that, Denise! 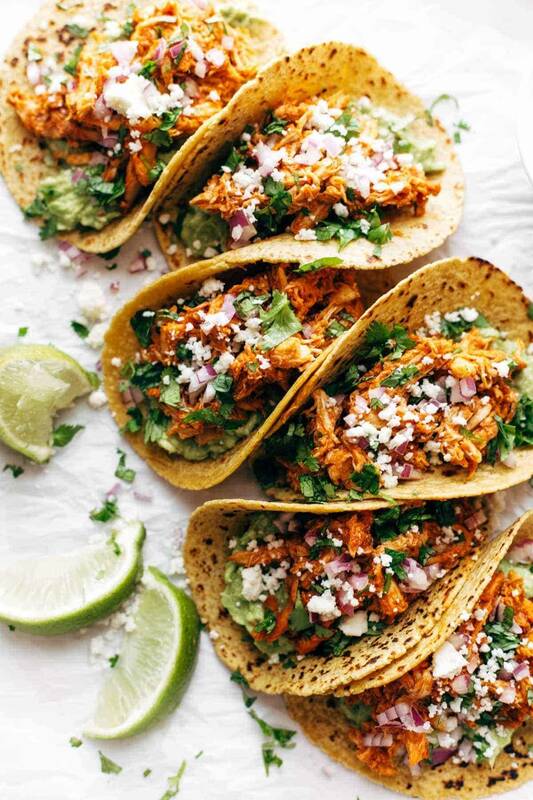 Nice and delicious Tacos right there! Great post! You deserve more attention Lindsay! You’ve convinced me this would be so delightful. Thanks for the recommendations on what steps we should take. I’m new to the instant pot and I have a question about doubling the recipe! If I want two pounds of chicken, should I double the sauce as well? And does that change the cooking time on the instant pot? In general, when doubling recipes for the IP, you do NOT need to change the cooking time, but you do need to ensure enough liquid so that it comes to pressure. Thanks! I’m trying it this week! These look absolutely delicious! I just started experimenting more with chipotles! Yum! This was so tasty! I added a little pineapple juice to the sauce for balance, and I cooked FROZEN chicken breasts in the InstantPot and then shredded them with a hand mixer (which is now in my top 5 fun home cooking experiences ever) and used that cooking liquid in the sauce. Even the 7 year old liked it! I <3 The Minimalist Baker! So excited about her cookbook! 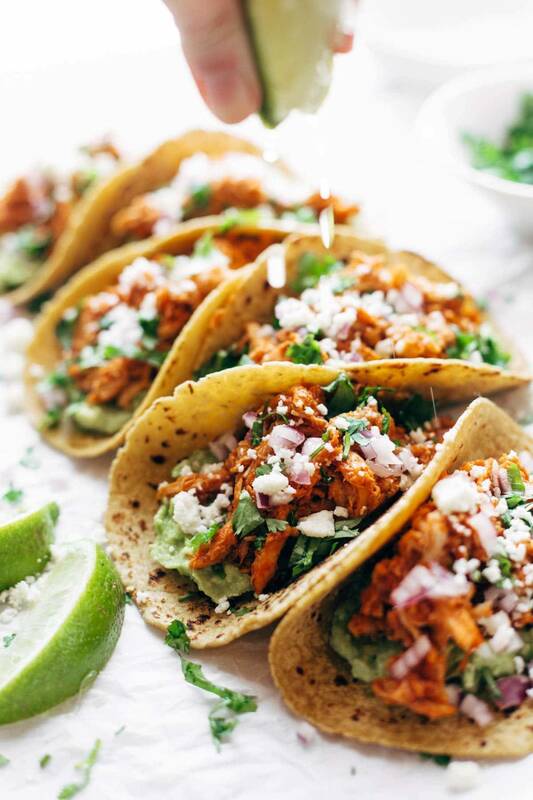 And these tacos…oh boy these tacos. It's breakfast time here on the east coast and I need one (or 5) NOW. Avocado mash on the bottom of tacos?!? You may have just changed my life… (in the very best way possible). You always do such a great job with food photography. These simply look amazing. I bet they taste every bit as good as they look too. It’s a first at our house. These are so delicious that we are making them two nights in a row. I made them in my OnePot and did sauce onions first–I love that flavor–and used goat cheese. Lots of goat cheese. We also added a side of black beans heated in the leftover juices from the chicken. It’s not even 6:30am and I’m ready for dinner! Thanks for this fabulous recipe. These look absolutely amazing!! Can’t wait to make them! Looks delicious, and super-easy! I don’t think I’ve ever seen crushed fire-roasted tomatoes in the market, but then I’ve never had a reason to look for them til now. Will be looking next trip! I’m sure avocado is the magic in this recipe can’t wait to try it. Made these tonight – SO good. I cooked the chicken, a mix of breast and thigh, by itself (and a little chicken stock) in the instant pot, then shredded it. Followed the rest of the recipe as is b/c I don’t like chunks of tomato. I topped it with the “spicy green sauce” from The Lean Green Bean and it was delicious. My kids gobbled it up too, so extra win! 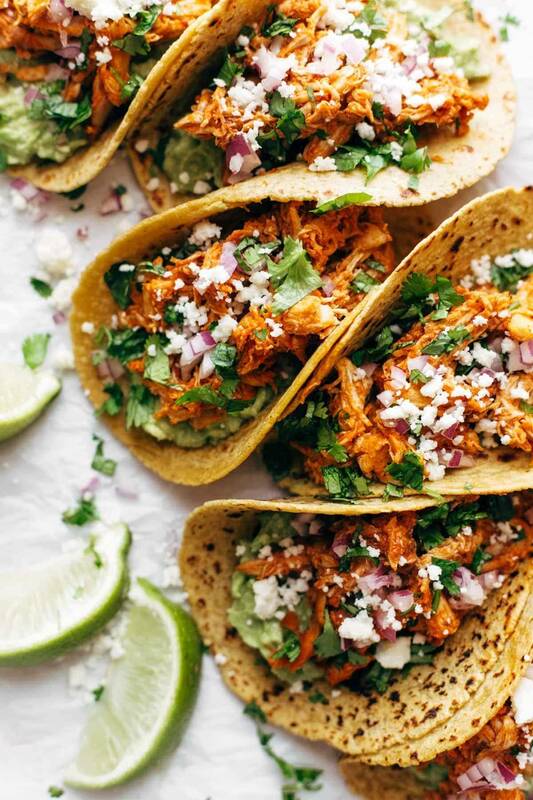 I am always up for a new chicken tinga recipe! So glad to hear about the cookbook, too! Really enjoyed this recipe! I found to original spice level (2 peppers) to be a little too bland, so I added two additional peppers and a little extra adobo sauce. SO GOOD! Glad to hear that, Amber! This sounds delicious. Any idea how much sodium and potassium would be in it? My hubby has to be on a low sodium diet. Thanks so much. HELLO I AM VERY FOND OF EATING AND MAKING NEW TYPE OF FOOD.MAKING AND LEARNING NEW TYPE OF DISHES IS MY PASSION SO PLS HAVE NEW AND UNIQUE POST ABOUT FOOD RECIPE . These are so good!!! The grilled tortilla, brilliant idea! My husband, who always complains that tacos are too difficult to reheat/make the next day for lunch (cuz he has to do it! ), made them TWICE on his own for leftovers. Yep, that’s saying something! Plus, it’s so easy! Great recipe!!! Looks fantastic! Is cotija a type of cheese?